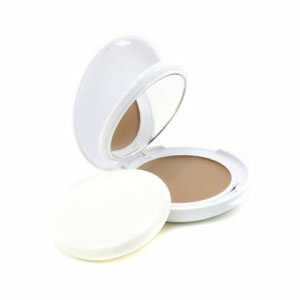 The High Protection Tinted Compact SPF50 specially formulated without chemical filters, is fragrance and paraben free. For sensitive skin, skin intolerant to chemical filters and fragrance. The High Protection Tinted Compact SPF50 covers a broad spectrum UV protection using a combination of exclusive ingredients from Pierre Fabre Research. Enriched in Avene Thermal Spring Water, the skin benefits from its soothing and anti-irritating properties. Very water-resistant, it provides a light coverage whilst leaving a matte finish. Two shades to choose from: Beige for light phototype (skin) and Honey for dark phototype (skin). Paraben and fragrance free.